Roomex once again features in the list of fastest growing companies in Ireland as recognized by Deloitte at the recent Technology Fast 50 awards ceremony. Cumulatively, the 2018 Fast 50 winners generated approximately €2.5 billion in total annual revenues in 2017. The average revenue of companies featured in the ranking was approximately €50 million, while the average growth rate of the companies over the last four years was 373%. “Through the awards, we recognise Irish technology companies that are at the cutting edge, using technology for progress, to address the challenges that we all face and create opportunities, both for themselves and for those that use their products,” David Shanahan, Partner and Fast 50 Programme Lead, Deloitte. In that timeframe Roomex has grown from strength to strength. But the pace of growth has really ramped up of late. 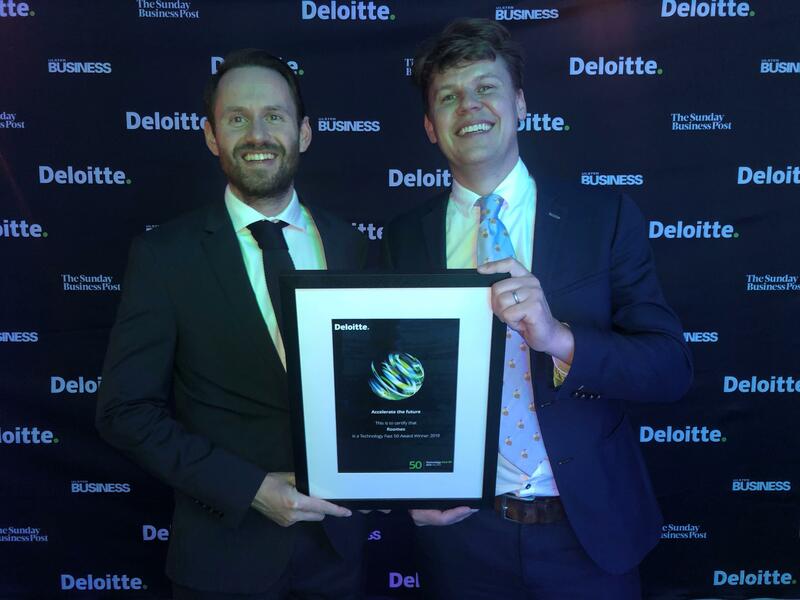 Collecting the Deloitte Technology Fast 50 Award on behalf of Roomex are Richard Sherry, E-Business manager and Karl Glennon, Chief Technology Officer. The global corporate travel market is currently worth over a €1 trillion a year, with Roomex filling a niche within the market where the process of booking travel had been predominantly manual, time-consuming and expensive for small and medium-sized companies. Traditionally dominated by consumer platforms or service-led travel management companies, travellers were forced to keep receipts and submit expenses, bookers spent hours searching for the best corporate rates, while accounts teams spent hours reconciling expenses to credit cards. With Roomex, those days are over, with our innovative platform saving travel planners and finance teams significant time, money and resources. “Technology is fast and ever-changing but it is also an opportunity. The Fast 50 companies demonstrate how technology cannot just solve problems, but create opportunities for businesses. They are an important reminder to us all, that when it comes to the change that technology brings, our mind-sets should be firmly set in opportunity mode,” David Shanahan.